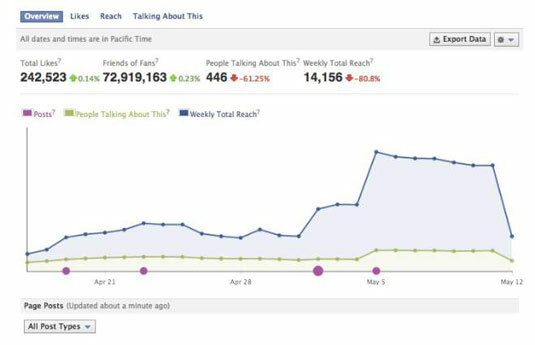 Forty-eight hours after creating your Official Facebook Page, you start to see exactly how people are engaging with it. From the Admin Panel, look for the graph at the bottom, and next to Insights, click See All. You are brought to the Insights page, where you can see valuable metrics about how people are interacting with your Page. When you navigate to the Insights page, by default, you land on a page showing an overview of activity on your Page. Total Likes? This shows the number of likes your Page has — in other words, how many fans you have. Friends of Fans? This shows how many friends your fans have — in other words, the people who might like your Page simply because one of their friends recommended it. People Talking About This? Unlike the previous two numbers, this number is calculated weekly. It goes up every time someone likes your Page, tags your Page in a photo, posts on your Page’s Timeline, and so on. In other words, every time a fan creates a story that goes into his or her friends’ News Feeds, it counts as talking about your Page. Weekly Total Reach? This shows you the number of people who saw any content associated with your Page in the past week. That can mean a post, a photo, an ad, or any number of other things. Next to each of these four numbers is an arrow indicating whether this number is going up or down, and by how much. In general, you want all your numbers to be going up or remaining constant. In general, posting content leads to more people talking about your Page, which leads to a greater weekly reach, which is why it can be helpful to look at these graphs as one. If you scroll down, you can see just how each post increased your Page’s traffic and reach. This can help you understand the kinds of posts people respond to, and which ones actually harm you. For example, if posting too many events is annoying people, chances are you’re losing fans. On the other hand, if your events never fail to get your fans talking, your reach and engaged users increase. Find out more about your fan base by clicking Likes (to the right of Overview). This section shows you breakdowns by gender, age, nationality, city, and language of those people who like your Page. By default, it shows you data over the past month. You can adjust the timeframe from the drop-down menu at the top. If you scroll down, you can see where your likes came from. It may be from people recommending your Page to others or from people searching for you on Facebook. Again, this can help you figure out if you need to grow your fan base and how you might reach more people. The next section shows the demographic breakdown of your reach, meaning the number of people who saw any piece of content associated with your Page. They don’t have to like your Page to see something a friend posts to your Timeline. This section offers the same breakdown as Likes, but for all the people who see your content, not just your fans. Use this section to look at who is talking about you, demographically speaking. Talking about a Page includes anything that creates a News Feed story. Things get interesting when you look at the comparisons — are you reaching lots of men but only women are talking about your Page? Or are you doing better in certain cities than others? These types of questions can help you further build your audience or just cater better to the needs of your audience. If your Page’s most vocal fans are people aged 18 to 24, make sure you post content that 18- to 24-year-olds will like and want to share. It keeps everyone wanting to see more.